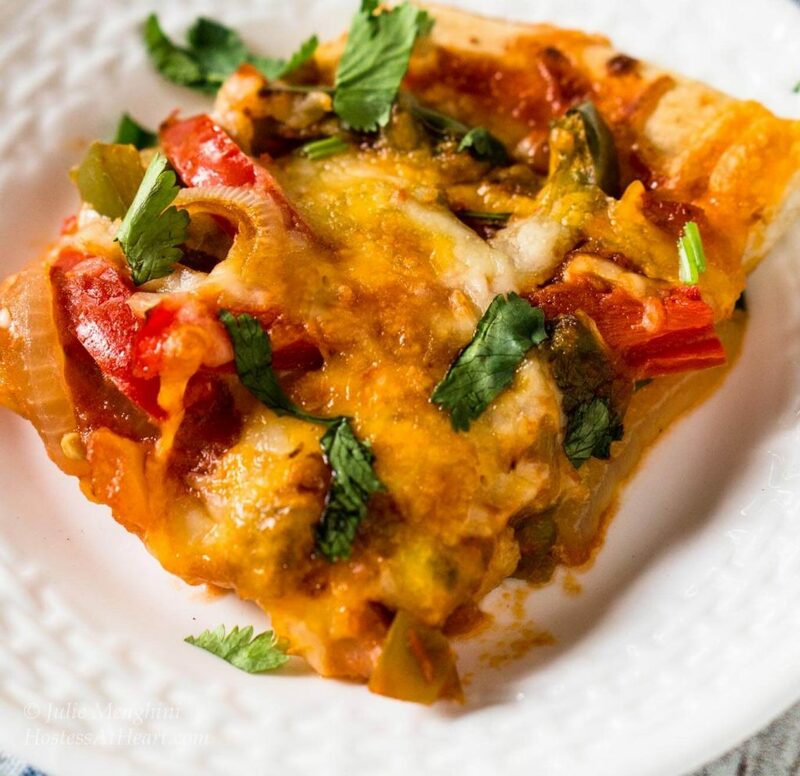 Fajita Pizza is a flavorful recipe that makes a quick and easy meal or appetizer. This is a vegetarian recipe and can be changed to you tastes. Several years ago I had a Fajita Pizza at a party that was served as an appetizer. I’ve made this recipe so many times, and each time I make it a little different. This version made John and I a delicious vegetarian meal but sometimes we will add chicken as a variation too. 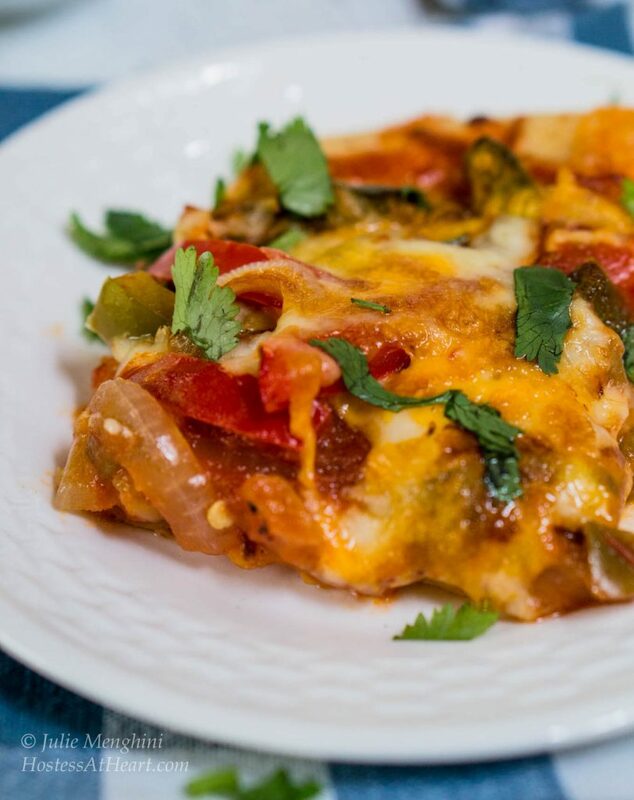 I’ve wanted to share this recipe for a long time, but just never got around to it until my blogger friend Sonal of Simply Vegetarian requested some recipes for a collective she’s putting together to help her celebrate her Birthday, Anniversary, Mother’s Day as well as Memorial Day. Boy, that girl has a lot to celebrate this month, and I wanted to help her. Sonal only asked that our recipes be vegetarian and semi-homemade. I finally found the perfect occasion to share this Fajita Pizza recipe and can’t wait to see the other recipes that will be added to this collective. This recipe makes a great meal even though the first time I had it, it was served as an appetizer. It is so versatile. You can use any combination of vegetables or even add diced chicken as we have at times. 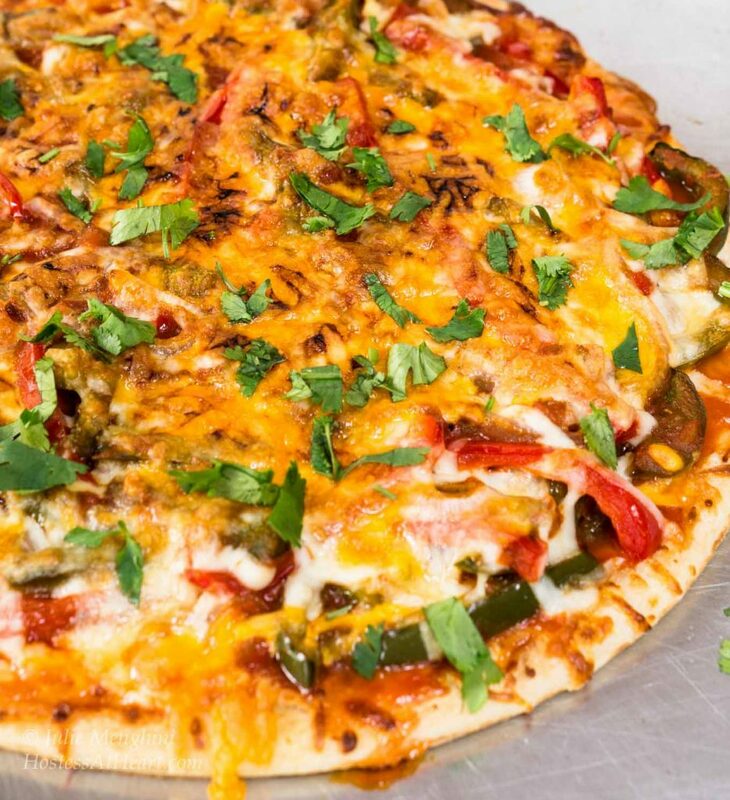 Fajita Pizza is a quick and easy recipe that is as delicious as it is versatile. It makes a delicious vegetarian dish or you can add meat for your meat eater. Preheat oven to 450 degrees F. Oil a cookie sheet or pizza pan. Add vegetable oil to a skillet and heat a large skillet over medium-high heat. Add peppers and onion. Saute until slightly softened. Add jar of Picante sauce and cook down until liquid is reduced. Place the Boboli on the baking pan and add vegetables. Cover with cheese and bake approximately 10 minutes or until edges of Boboli are browned. Allow to cool slightly. Garnish with cilantro. It’s always fun to share so let’s head over to Fiesta Friday and Saucy Saturdays. Wow, Julie. What a fantastic recipe. Fajita pizza?! How have I never thought to combine two of my favorite things? Thanks for sharing at Fiesta Friday #117! Thank you so much Scarlett! I just love FF, and really appreciate you stopping by! Thank you Sarah! It’s quick and easy! What a nice idea, Julie! Looks really tasty! Thank you Mila! Hope you are enjoying your weekend. This would be so perfect for a busy day and I love fajitas – I might like this even better with all that cheese, lol! Thanks for bringing this to Fiesta Friday! Thank you! Our children loved it and it is quick and easy. Friends just had us over for a fajita dinner. I can’t wait to share your recipe with her…I know she will like the idea as much as I do. Thank you Karen! I really appreciate your sharing! Thank you Nancy! My kids always loved it too. So yummy, Julie! I would eat this in a heartbeat ! I was in need of a Cinco de Mayo main dish for friends coming over, and this is it! Looks delicious! Thank you Susan! It’s so easy! Don’t you just love the different toppings you can put on a pizza Julie? Fajitas are one of my favorite wraps – love onions and pepperss. Thank you Judi! I do love the versatility of this kind of recipes. I’m so excited to get my hands in the dirt and get some things growing. My snow peas, radishes, spinach are sprouting – no carrots yet. Some bunnies ate all of my lettuce last year so I have not planted any. Except my new neighbors have cats and they already have killed one baby and left it in my yard. Thinking more seriously about moving and downsizing… Have a great weekend. I’ve thought of downsizing and wonder where I would put all my kitchen stuff! Yikes! For some reason we don’t have any rabbits in our yard. We had more when I had a big dog? We have a ton of squirrels though. Hope you are having a great weekend. Thank you Dini! I’ve been overdosing on Mexican food too. I just love it and it’s the food I crave the most. I always say chips and salsa is my drug of choice. Thank you Ana! Quick and easy and just waiting for those veggies to hit the farmers markets! Have a great weekend Ana! Wow, Julie! Had me licking my screen!! What a great quick n’ tasty meal to get together Julie. I like your semi-homemade version of this fajita pizza. I need to get my thinking cap on to submit to Sonal. Thank you Loretta! It was always a huge hit with the kids too. I can’t wait to see what you come up with! Thank you sweet friend! I was kind of worried that it might be a bit like your pizza that you did not long ago. Great minds right? Have a wonderful day! This pizza looks delicious, Julie! I never would have thought of making fajitas into a pizza. Such a great idea! It’s nice you used a prepared pizza crust. Sometimes you just need something quick like that. Thanks for sharing your recipe! Thank you Shari! You’re right, we don’t always need to work so hard to make something yummy. Hope you have a wonderful day! This looks great, Julie! Quick and easy, yet delicious! I will definitely keep this recipe in mind! Thank you Jenny! It really is quick! Thank you Sarah! The first time I had something like this I wondered the same thing! Thank you! We really enjoy it.